If I want to make a meal that everyone in the family willingly eats then I make this. If I want to make a meal that is cooked and ready in 30 minutes then I make this. If I want to eat a meal that tastes like comfort food but really is a pretty healthy option, then I make this. My pictures don't really do the dish justice. The top was almost perfectly golden but I wanted to give it one more minute to ensure maximum golden cheesy bubbliness. But then I got distracted with 'Mum' calls and I let it go just a little too far into 'browned' territory! 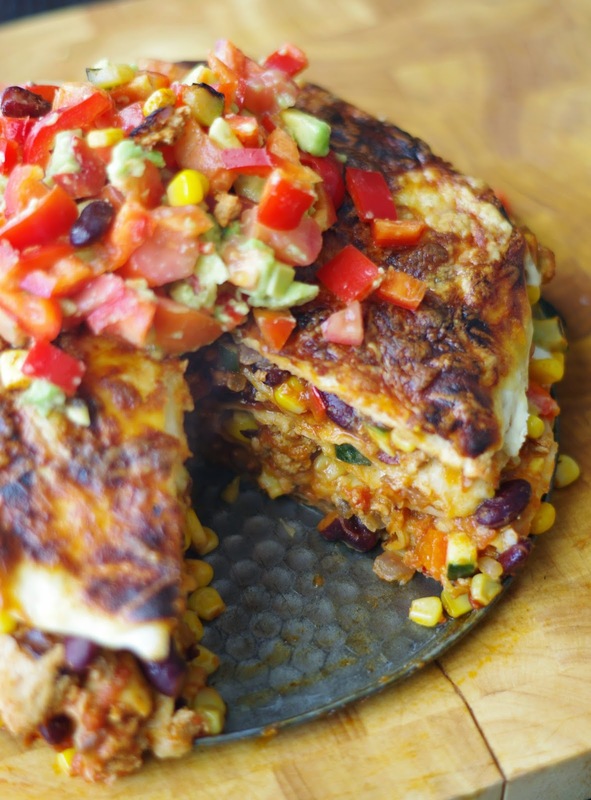 With it's layers of meat and tortillas and cheese I like to think of it as a Mexican Lasagna. Do take the time to let it sit for 10 minutes out of the oven as it helps to keep the layers in tact when you cut it. 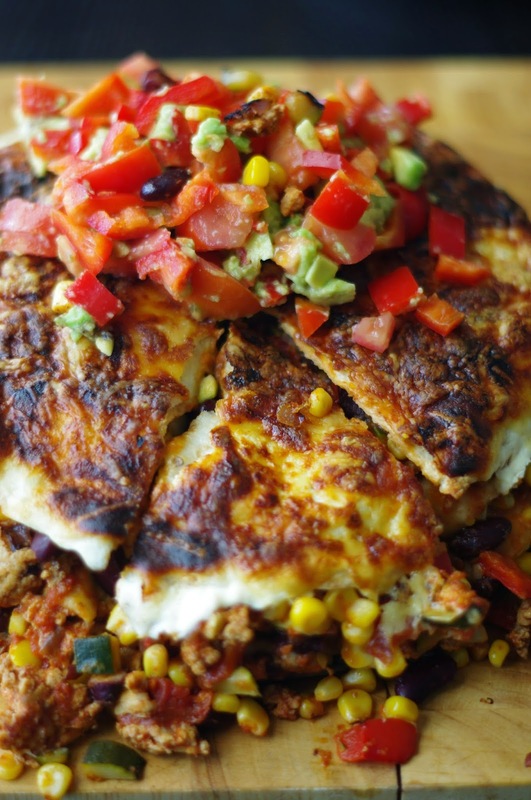 You could obviously use tortillas instead of wraps, or beef mince instead of chicken. I've also added lentils and/or mushrooms to the mince mixture. You could use sour cream instead of the Greek yoghurt, but give the yoghurt a try. I use Chobani 2% plain Greek Yoghurt and you'll be pleasantly surprised at how well it works at creating the creamy cheesy top layer. Heat oil in large pan over medium heat, Saute onion and garlic until soft. Add paprika, chilli and cumin. Cook, stirring, for one minute or until aromatic. Add chicken mince and cook until golden. Add tomato, tomato paste, corn and kidney beans. Simmer for a few minutes or until slightly thickened. Add zucchini and half of the capsicum. Cook stirring occasionally for a few minutes until tender. Cool for 5 minutes. Spray a 20cm spring form pan with cooking spray and place on a baking tray. Place on wrap in the prepared pan. Top with 1/4 of chicken mixture. Sprinkle with cheese. Repeat steps finishing with wrap on top. Spread Greek yoghurt over the top of the wrap and sprinkle with remaining cheese. Bake for 15 minutes or until cheese is golden. Let sit in pan for 10 minutes. Combine the remaining capsicum, avocado and tomato. Toss to combine and serve with tortilla pie and salad greens. What's your current go-to, please everyone dinner of choice? Yum! This looks delicious. I might have to try the meat free version. I've used yoghurt in bakes like this before and it works really well, doesn't it?! At the moment, our quick and healthy dinner are Mexican Bean Burgers. I make a big batch, stuff them in the freezer and then pop them into the oven at dinner time, from freezer to plate in less than 30 minutes! Winning! Mexican Bean Burgers sound great, I haven't made veggie burgers for a while, I'll have to add them back into the rotation or freeze them like you suggest - brilliant! Danielle this is brilliant! I'm always looking out for tasty, easy, healthyish weeknight meals. This is definitely getting a run in my kitchen. I feel your pain with the Mummy calls! I don't know how many times I've overcooked dinner because I get a little bit distracted. I would never have known you did with this dish, it looks amazing! have a great weekend! Mexican in a pie form? Who knew! What a brilliant idea. I am definitely going to try this! Thanks Jessica, you won't be disappointed! Oh yes! I used to make one of these fairly regularly but it had completely slipped my mind. 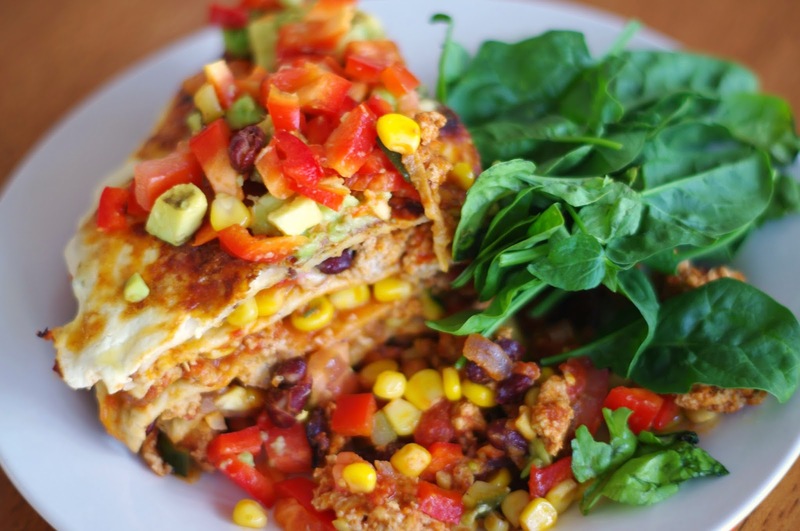 Your version looks so good and I love the healthy dose of veggies. Definitely making this soon. Sold! This looks delicious am going to have to give this a try. thank you so much for linking up to our first Your Weekly Feed too. 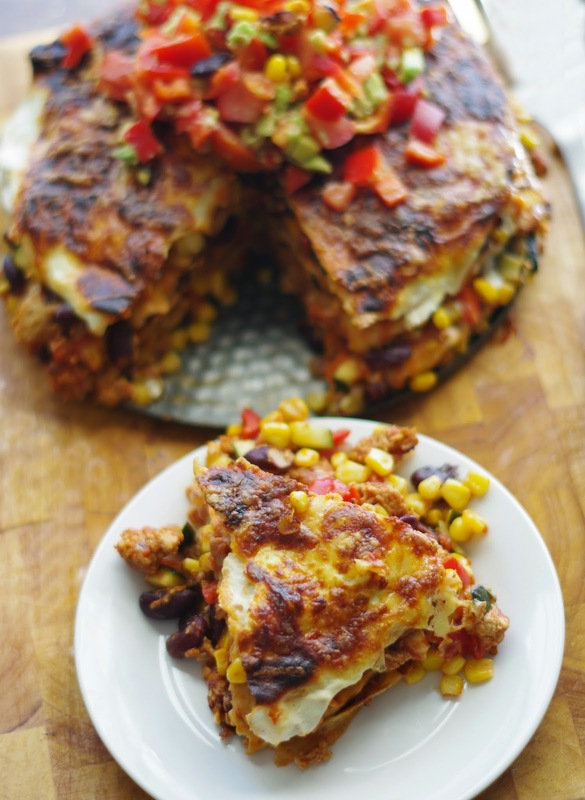 I love making stacked quesadillas, yours looks incredible, no wonder everyone loves it!